It finally arrived. 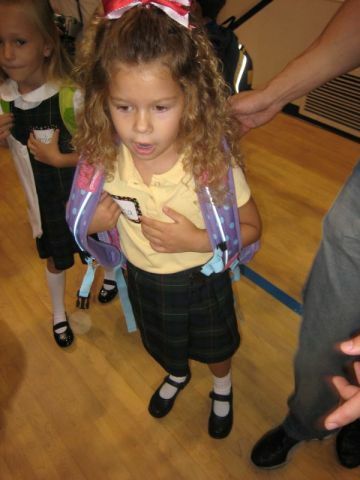 Mara’s first day of kindergarten is here. I didn’t get to talk to her about it until tonight and it was so fun for her. She couldn’t stop talking about how excited she was, and how long she had been waiting for this day to come, and it is finally here. She is super cute about it. I think that we are really lucky to have found Caldwell Academy and it is going to be a very special place for her. We got to go into the school for an open house on Monday, and that is where some of the pictures we have are from. Today we didn’t go into the classroom, and instead let her go from the auditorium after the morning greeting. We can’t wait to see what happens next!